I was able to go to the brand new Coyote Drive-In near downtown Fort Worth last night. I went with my husband and our two small girls ages 2 and 4. We met our friends there who actually called us up early on Saturday to invite us with their 4 year old daughter. They had went last weekend and actually only knew about it due to Brian seeing it from his pharmacy tech school located in downtown Fort Worth. It was perfect. All of us had been looking into going to a drive-in for a while now but the drive to Grandbury, Texas, to the Brazos Drive-In or others were all over an hour away. That was just not going to happen without having to rent a hotel room to stay the night after attending the movies. Drive-Ins seem to be making a come back. Maybe its because our generation remembers going to them regularly as children. I remember going to one in Oklahoma City as a teenager occasionally. I forgot how much fun going to a Drive-In was! This one has three screens. All three were showing different double features. The Coyote Drive-In was founded in 2011. They charge only per person in the car and not per carload. This does add up. The pricing last night was $8 for adults and $6 for children 3-6. They have no military, student nor senior discounts yet so that cost our family $22. We were told that they were working on the discounts and they will be coming soon. They do take cash or credit/debit cards for entrance fees and concessions. They open the gates during the summertime at 6pm. No outside food or drinks are allowed. We arrived at 5:50pm and were in a line waiting to get in. We were in one of three lines on different streets merging to the one entrance. We were probably over the 30th car through the entrance gate. They had traffic directors with hand cones to direct us into one of four gate lanes once through the main entrance gate. I was impressed with the fact that they had two employees working each lane. They were actually leap frogging the cars for the entrance fees so the line was moving pretty quick. Once in we found the Murphy's at Screen 3. We were going to see the double feature of Monster U and Now You See Me. All 6 Movies playing were new movies at the regular indoor theaters. I was quite impressed. I would advise getting there early like we did. It seemed like all three screens filled up pretty fast. We parked the car and walked over to the large outdoor partially covered Canteen. We had a blast. The shows weren't starting until around 8:30pm and we had almost 2 1/2 hours to kill. Not a problem to do that here. Their Canteen had several picnic tables and benches under the Canteen and out and around the grassy sections of the fenced in area. It was quite nice. The Coyote Canteen had another fenced off Playground area in it, made out of boulders from the local area. The bathrooms were located in the Canteen area and they had many stalls. The bathroom sinks were outdoor metal sinks located outside of the stall areas. They were VERY Clean. The concessions consisted of a large concessions area built into the Canteen with several options and checkout lines. They do serve beer ($3) and wines too. The wine is purchased by the bottle. Fun Social Environment before and during the shows. I was also impressed with the fact that they had a mini-stage set-up with live music playing. It was a nice environment to be in for everyone and we had a blast. Again, I suggest you get to the Drive-In early, lock up your vehicle and head over to the Canteen. Not only did all three screen areas fill up fast but so did the Canteen area. There is no movie ticket required to enter the Canteen from 6pm-Close and there is free parking outside of the entrance area for those that choose to simply be patrons of the Canteen. Overall, I was very impressed and can't wait to do it again! I would recommend going to the Coyote Drive-In. We had a great time! The large moon rising over the screen while it was playing, seeing shooting stars and the beautiful Fort Worth lit up skyline so close while watching the movies on a wonderful Texas summer night was priceless! We along with several people actually got to see fireworks in the distance from the Fort Worth Symphony Orchestra's 1812 Overture and Russian Sparklers concert playing at the Fort Worth Botanical Gardens. This is from their Concerts in the Garden Summer concert series. What a night! 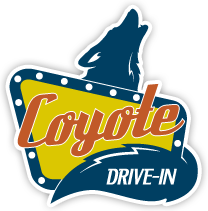 The Coyote Drive-In is located at 223 NE 4th Street, Fort Worth, TX 76164. Their contact number is 817-717-7767. Click here for their website. Click here for their Facebook page. Coyote Drive-In sent our blog photos for approved publishing. They also authorized usage of their logo on our blog. Thank you Coyote Drive-In! Additional notation by author: Although the Coyote Drive-In was founded in 2011, it has only recently opened its doors on May 10, 2013.